It is an amazing experience to relax on one of Moonstone Beach Villa’s outdoors dining area’s. When viewing the aqua-marine coloured ocean, constantly changing, the soft winds complementing the warmth of the Caribbean sun, one can not help but make you breath deeper and just live in the moment… The mile long white sandy beach, inviting you to come for a walk, swim, snorkel or just to be, is a stone’s throw away. Palm trees are waving you in to shade you, with tropical drinks available at the beach restaurants. Resting at the villa, a good book at hand, using the hammock or lounge chairs with your favourite drink, while hearing the waves breaking on the shore is Heaven on Earth. How can one describe the experience of looking up from the hammock, taking in the greens and ochre of the large palm tree leaves, weaving in the ocean breeze. The tree crown loaded with clusters of ripening coconuts, you listening to the ocean. A cobalt blue sky framing it all. All rooms are fully air-conditioned, if desired. Powerful ceiling fans silently cool the room with the ocean breezes flowing through the open spacious french doors. All floors are interconnected by a central staircase. THE PENTHOUSE can be rented as a separate unit. It has a fully equipped kitchenette (cooktop, refrigerator, coffee-maker, toaster oven & toaster), a desk area, a king-size bed, seating areas inside as well as on the large covered balcony. The high vaulted ceiling adds to the pleasant spacious experience. The balcony has a teak table and chairs for superb dining. Two captain chairs let you relax with an after dinner drink. The 3 piece bathroom has a spacious walk-in shower with ability to sit down. Of course this area provides dressing drawers and closet space. There is a 32″ flat screen TV with DVD player, I-POD player and Direct TV for your entertainment. THE GARDEN SUITE & STUDIO are rented together and features an open concept of the living room, with desk, and fully equipped kitchen. The counter has an extended bar so cooking and socializing becomes enjoyable. The dining area is on the gorgeous covered deck providing teak furniture and lounge chairs with hammock as well as a new plunge pool. The garden suite bedroom has a king size bed with iPod dock and a living room with satellite TV and DVD player. The spacious 3-piece bathroom provides a walk-in shower also with sit-down area. The bathroom provides the dresser and closet space needed for long term stay. THE GARDEN SUITE STUDIO is very private from the garden suite. It has a king-size bed, spacious bathroom with shower and single vanity, and kitchenette with coffee-maker. It also has it’s own entrance. There is a small deck with two lawn chairs. It also has satellite TV and an iPod dock. The beach is a stone’s throw away from the villa. It is lined with Palm trees. The villa is in an elevated position, which allows for astonishing ocean views. 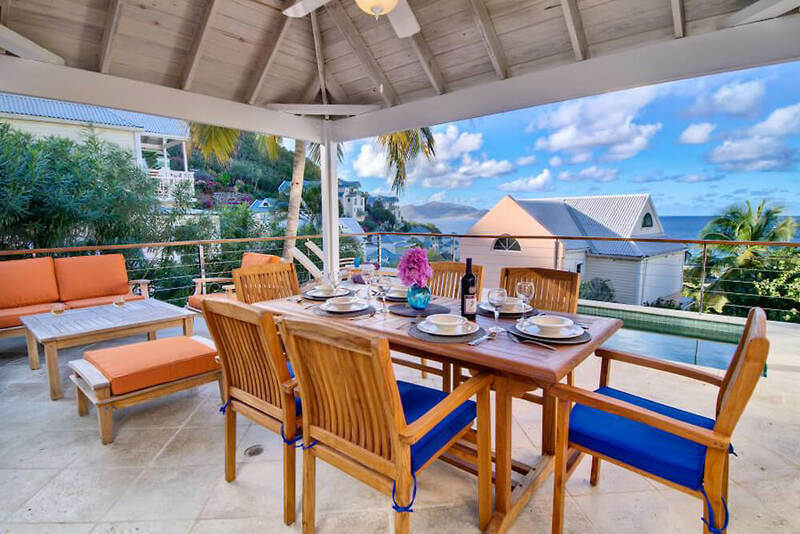 It is one of the villas that form the Long Bay Beach Estate at the west end of Tortola. Moonstone Beach Villa has a colourful flowering garden with Palm Trees. There are many excellent restaurants around on the West-End, along with the possibilities of day sailing, boat rental, scuba diving, snorkelling and surfing. Snorkeling and surfing can be done right at Long Bay beach. Parking is right in front and behind the villa, no long drag with luggage and shopping. Food can be ordered over the internet with delivery to the villa. Catering can be arranged at your request. Housekeeping is once midweek or every 4 days for longer stays. All linen and towels will be changed and a general cleaning will be done. Daily housecleaning can be made available. WIFI throughout. At Stay at Moonstone Beach Villa is Like Heaven on Earth!